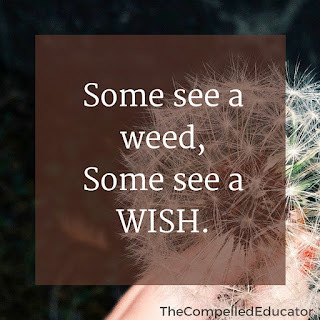 The Compelled Educator: Do you see a weed or a wish? As kids come to us at school, they don’t always feel like they owe us anything - including their respect, care, concern, or attention. Sometimes this is because they’ve been burned by adults in the past. Adults they thought they could count on. Adults that were supposed to have their backs. Kids learn to avoid trust. To count on someone else. To feel like they deserve happiness. When you meet kids like that, do you see a weed or a wish? Some kids come to us who look like we do. They say “Yes, ma’am” and “No, sir” and they sit in their desks straight. They write neatly, and they always turn their work in on time. They say “Please” and “Thank you,” and they always get to class on time. What about those kids? Do you see a weed or a wish? Some kids come to us with dirty clothes and unbrushed hair. They are always late to their first class because they are getting their free breakfast in the lunchroom, the first thing they’ve eaten since their free lunch the day before. Some kids don’t read easily, and they don’t seem to care about their grades. They don’t do their homework all the time, and they don’t ask questions in class or volunteer to give input in class discussion. Some kids are loud and active. They want to sharpen their pencils or walk to the trash can at least once during the class period every day. They can’t sit still in their desks, and they forget to raise their hands when answering a question. They can’t find their work without going through their backpacks, which are jammed full of papers and other school supplies. The awesome thing is this: It’s a choice. OUR choice. 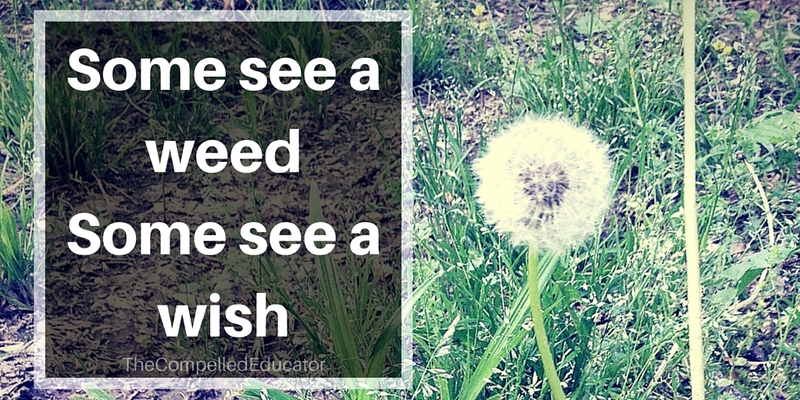 We get to decide how we will view all kids. While the kids may come from different backgrounds, with different baggage, they all enter our doors where we choose our expectations for them. What will you choose to see? you end up seeing the good in yourself."